The thing that most impressed me about this show was the staging and the set. 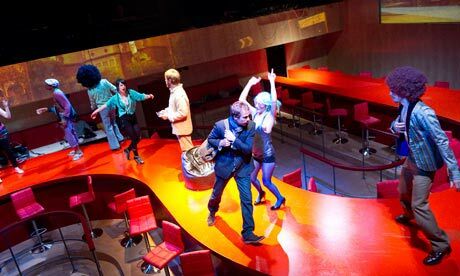 Cottlesloe Theatre was transformed into a walkway that snaked, where audiences sat on bar stools or stood off the catwalk. There were two boxed alcoves on either end, and then images and videos were projected on the walls of the whole room. Simultaneous plots would be staged at the same time, with characters weaving between each other, completely in their own situations and environment. The environment would change from minute to minute, supported by the sound, the sights and the people. A feast for the eyes.